The mobile industry has witnessed an unexpected change in recent years. Along with the number of users, revenue of the mobile app industry is surprisingly growing. 2017 has arrived at the end of its journey, and till date, extensive advanced technological changes have introduced. iOS app development is one of the areas that have witnessed the extensive transformation. 2017 saw the envious revolution in iPhone app development & iPhone app development company in USA plays a significant role in it. Apple is the technology leader and embraces the latest technology for ensuring added consumer convenience. iPhone users expect uniqueness and excellence from Apple. The primary role of the mobile applications has broadened as the utility of the apps has encompassed multiple aspects of our day-to-day life. Advanced tech features have established a positive impression, but few of the advanced technologies could come up with the expected results. 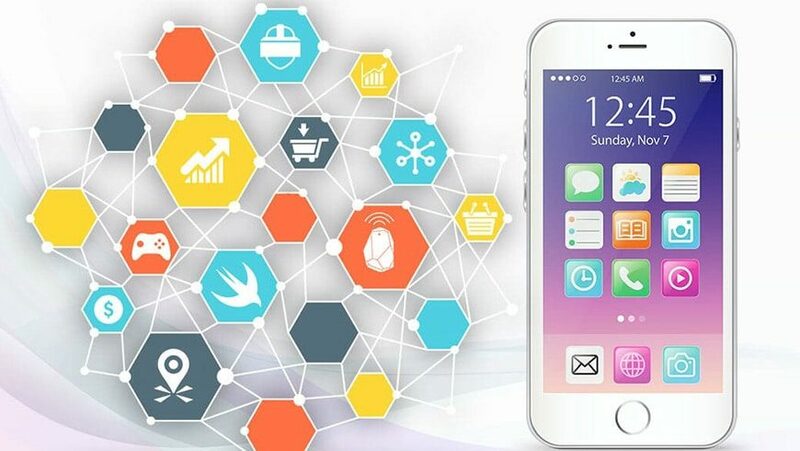 Various latest technologies have affected mobile application development especially iOS & Android and to draw the spectacular advantages from the advanced tech opportunities, it is essential to learn about the techniques and plan accordingly to bring the edges. Learning about the iOS app development latest technologies, the developers can develop future apps! 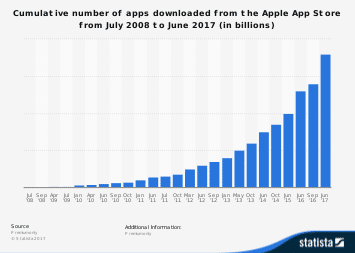 This statistics shows the increasing number of app downloads from the Apple App Store from July 2008 to January 2017. This report can be helpful to determine the growth rate of iOS app downloads. AR or Augmented Reality is a familiar term in the tech world. AR successfully has got involved with the domain of iPhone app development. Extensive use of AR in the gaming industry has created vast influence on the iOS app developers. The developers use AR for ensuring advanced as well as an upgraded gaming experience. AR integration with the iOS apps has become a trend as it adds excellence to the iOS apps and ensures excellent user experience. iBeacon technology is ahead of varying additions to the functionality of iOS apps. Coordinating with the GPS technology, iBeacon technology has paced up different marketing efforts implied for targeting the customers individually. 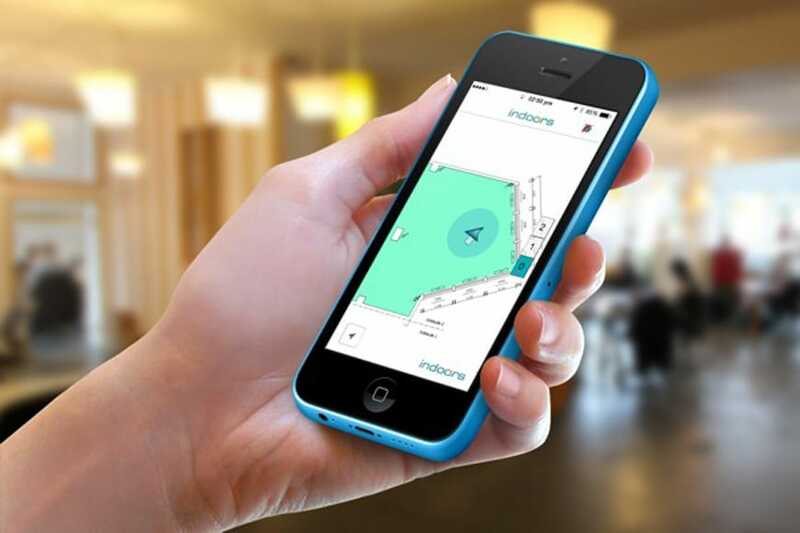 With integrated GPS technology, iBeacon technology supports the iOS app developers to deliver the apps combining the power to serve the app users as per the location-based preference. Users are allowed to access corporate data from their iPhone through the cloud-based applications. With cloud-based applications, business people can establish a good connection between the colleagues as well as clients in distant locations through the cloud-computing features. AI regarded as the future of technology! With the impact of Artificial Intelligence, iOS provides excellent results to the business owners as well as the individual users. The iOS apps giving a guarantee to scale up user-experience to the upper level achieve success. With the implementation of AI, the iOS apps rule the business world. IoT- Internet of Things industry witnessed enormous growth that increased to IoT developers. The ecosystem of mobile application development needs to sync with the growth of advanced technology and trends. In the upcoming years, iOS app development must involve the trend and develop IoT based apps. Integration of IoT will need multiple mobile platform along with robust backend infrastructure. Such tech integration will help to communicate and share data among different devices. App security is the primary concern for the app developers, though the app developed with excellent features. App developers must provide apps with in-built security features that would keep the users protected! App Transport Security or ATS imposes the best practices for establishing a secured connection between the app and its backend. For the iOS apps, it is compulsory for the iOS apps to ensure and prove the security features as specified by ATS. ATS provides secured behavior by default and prevents the accidental disclosures. ATS is quite easy to implement and is available in iOS 9 as well as OS X v10.11 by default. iPhone’s inbuilt security features are inevitably progressing with the tech updates. The iOS app developers require adopting the standards to develop iOS apps for future. The future iOS apps are on edge to make their way to the trending and demanding market is integrating the new features. With the above mentioned latest technology trends, iOS app development will undoubtedly update the developer’s outlook on developing apps with the upcoming trends. Apple is the technology leader, and it would never leave any stone unturned. There are many iOS app development companies & individuals are developing applications with the latest trends. You can hire iPhone app developers USA that delivers an app with latest technologies. With the latest trends, Apple would ensure to make its way to the leading position. Such trend of adopting latest technology could be challenging for the businesses, but it would help the brands to secure an outstanding position in the iOS app market. How to Develop Cost-Effective Cross Platform Mobile Apps and What are Its Benefits?